This week I am hosting some guest bloggers. This is a guest post from Amy Pietrowski. When I started teaching with Google Apps several years back, I never envisioned that I would be using them with Kindergartners and first-graders. The logging in factor (yyyylastname.firstname@mail.domain.org) alone would be enough to send any five or six year old into hysterics. Many of my second graders struggle with this well into the school year. Enter Android Tablets into our district: The bad news was that I had to enter each child’s Google ID into the tablet. The good news was it that was a one-time only deal. From that day forward I could walk into any kindergarten or first grade classroom and have students creating products, sharing with me via Google Classroom, and saving to their Google Drives in seconds. So, how did I do it? Skitch is a simple mark-up program from Evernote. Students would create a fact family with real two-sided counters. Next they would take a picture with their tablet using the Skitch app. After using the writing tool to write the addition fact, it’s “turn around” fact, and, depending on skill level, corresponding subtraction facts, the student would then share their product. There are several sharing options in Skitch, but for this assignment we chose to use Google Classroom. I created an assignment ahead of time. Once they had used a one-time short code to get into my class, they only had to click on the assignment and attach their picture to it. Once “turned in,” I could view all of the creations in my classroom folder on Google Drive. In turn, I shared this folder with the classroom teacher, so she would have a copy of their artifacts. Teachers love graphic organizers, and using Mindomo is great way to save physical creations in a logical way. 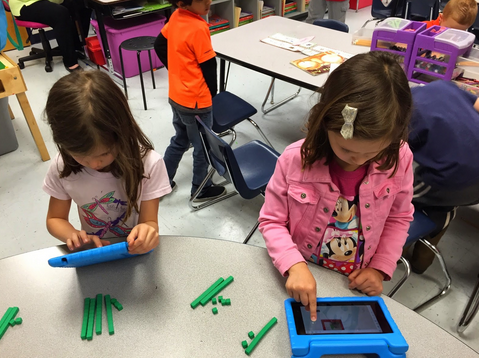 On this day, first graders were creating two digit numbers with base ten blocks. They captured two “numbers,” then put them together to create the number at the top. They labeled their boxes and used Mindomo’s connecting tools to show the relationship between the three pictures. What is remarkable about this activity is that Mindomo let the students save their graphic organizer to their Google Drive. 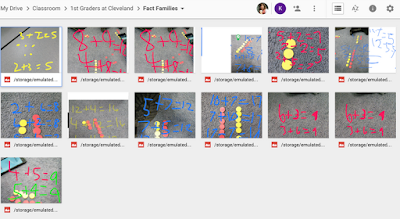 Now, and in the future, when the students open their Google Drives, they will see the work they have created in first grade. When the first grade teachers asked that I review parts of a plant with their students, I knew that Thinglink would be an awesome tool. My fifth graders used pictures from loc.gov earlier in the year and made great creations about their Civil War studies. Thinglink allows you to “tag” a picture with other pictures, audio, and video. While the desktop app would be difficult for my first graders, the mobile app was perfect! 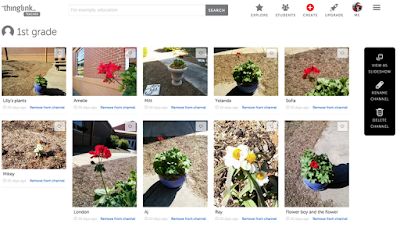 Using their Google Accounts (already on their tablets), students logged in, snapped a picture of a plant, and proceeded to add tags. They labeled words they knew (stem, leaf, etc) and added video files to talk about what a plant needs to survive. Here is one from a student who combined both aspects well. As the students finished up their “scenes,” they saved them onto their thinglink accounts and into my group. They also used the save to Google Drive feature which creates a text file with a link to their scene. All of these activities would have been nearly impossible without the combination of Google Apps, tablets, and a little bit of up-front work. I DID enter all of these students’ credentials into the tablets (just once). Also, if you would like to use a Google ID with your Thinglink EDU account, students must be added via Thinglink.com/edu on the computer. However, the up-front work was worth every artifact the students created, shared, and saved for the future. Amy Pietrowski is an experienced classroom teacher who has taught at all grade levels and in many subject areas. Her passion for technology stems from an experience learning LOGO and BASIC at computer camp in the third grade, and she has since relished any opportunity technology has given her to create and share. Amy is currently an instructional technology specialist in Fayette County and an Instructor for the MAET Certificate program at Michigan State University. You can follow Amy on twitter @amylpie and read her blog here: http://techieteacherpie.blogspot.com.